Trump Isn't Stopping With Kavanaugh. He Just Nominated 13 More Judges. 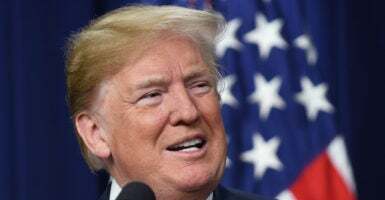 President Donald Trump announced his 18th wave of judicial nominees Wednesday night, just four days after the Senate confirmed Justice Brett Kavanaugh to the U.S. Supreme Court. Michael Park of Consovoy McCarthy Park PLLC, a litigation boutique with a conservative bent, and Judge Joseph Bianco of the U.S. District Court for the Eastern District of New York were tapped for the 2nd Circuit, while Patrick Bumatay, Daniel Collins, and Kenneth Kiyul Lee were selected for the 9th Circuit. Bumatay is a federal prosecutor. Collins and Lee are appellate advocates in private practice. The package also includes eight nominees for trial courts in California, Nebraska, New York, Ohio, and Tennessee.